Tropics is a lifestyle brand with all the values the name suggests. Bridging the gap between artist management and merch retail, Tropics speaks to the MTV generation. The aim was simple: translate the sunny attitude of the brand to a digital platform, which embraced users on a variety of devices. CRAVE DELIVERED A FULLY RESPONSIVE E-COMMERCE WEBSITE IN SUPPORT OF ESTABLISHING TROPICS AS A LIFESTYLE BRAND. THE SITE CONTENT, WHICH RANGES FROM VIDEO AND SOUNDCLOUD TO IMAGES AND ARTICLES, IS HOSTED IN MULTIPLE LAYERS WITH AN INFINITE SCROLL, AND FILTERED BY POST CATEGORY. THE RESULT IS A DYNAMIC INTERFACE WITH AN ORGANIC UX. EXTERNALLY HOSTED CONTENT IS SEAMLESSLY LOADED IN AND PLAYED ON SITE KEEPING BROWSERS ENGAGED AND ON THE SITE FOR LONGER. SITE WIDE SEARCH FUNCTIONALITY MAKES FINDING CONTENT SIMPLE. 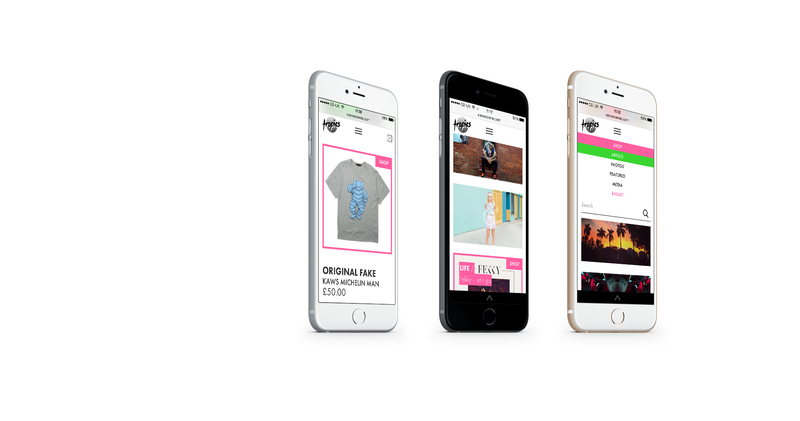 A RESPONSIVE FULLY SCALABLE DESIGN WITH ADAPTIVE SHOPPING EXPERIENCE FOR MOBILE USERS ALONGSIDE A MOBILE FRIENDLY CHECKOUT PROCESS COMPRISES THE E-COMMERCE ASPECT OF THE SITE. ON MOBILE & TABLET, LARGELY SINGLE PAGE CONTENT HOSTING MAXIMISES THE MOBILE USER EXPERIENCE.